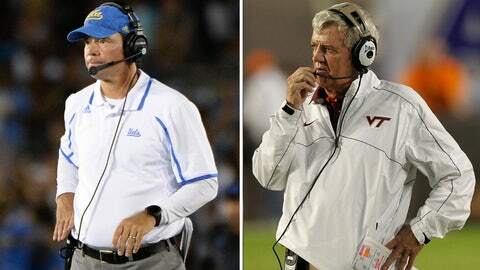 It will be an intriguing storyline at the Sun Bowl as UCLA coach Jim Mora, the hot up-and-comer, goes up against Virginia Tech coach Frank Beamer, the old dog who still looks to have plenty of fight in him. This week, the Bruins began the breakdown of film on Virginia Tech, and the one aspect that jumped out at head coach Jim Mora was the overall influence of longtime head coach Frank Beamer. "Beamer Ball," Mora said. "They play great special teams and outstanding defense, that’s what they do. They play hard, they play with discipline." Beamer, both the head coach and the special teams coach, is about to conclude his 27th season at the helm of the Hokies. He’s led them to an 8-4 record and narrowly missed out on a second-straight trip to the ACC Championship game, and the style of play this season was no different from any other: a fundamentally sound brand of football that has become the trademark of the Beamer-led team. "You don’t see technique errors, you don’t see missed assignments," Mora said. "You see a bunch of guys that know what they’re supposed to do and do it with a lot of certainty, and they do it fast and they do it with bad intentions." If I’ve got a good quarterback and a good kicker then I feel good, and I’ve got all of those things going right now. But some have wondered if "Beamer Ball" might be a little outdated these days. At a recent press conference in Blacksburg, Va., Beamer was asked about his two best friends in coaching, Texas’ Mack Brown and Wake Forest’s Jim Grobe. Both are set to retire following the conclusion of the 2013 season, and it hasn’t been lost on the 67-year-old Beamer. "Jim and Mack are probably my two best friends in the business and it just kind of reminds you that nothing is certain in this business," Beamer said. "I’m very sensitive to staying around too long. I feel great, like I told you if I’ve got a good quarterback and a good kicker then I feel good, and I’ve got all of those things going right now." It doesn’t seem as though the program has slipped into a level of mediocrity or worse yet, but the coach is aware that it takes much more than just being bowl-eligible to keep a job in BCS football these days, much more so than when he first started. He says very matter of factly that the business has changed. "I’m very appreciative of Virginia Tech and they stuck with me when things weren’t good and stuck with longer than most people would," Beamer said. "That probably won’t happen again. It’s a performance business and I fully understand that." At the moment, he does possess a good kicker — two to be specific — and a good quarterback in Logan Thomas. Although Thomas is a senior, he’s got a few more sitting behind him that fit a similar mold. [With Virginia Tech] you see a bunch of guys that know what they’re supposed to do…they do it fast and they do it with bad intentions. It will be an intriguing storyline as the CBS cameras pan to each coach on the sidelines at the Sun Bowl in El Paso: Mora, the hot up-and-comer that has now heard his name thrown out there for every major job open, and the grizzled veteran. But for now, the old dog still looks to have plenty of fight in him. "They’re impressive to watch," Mora said. "They’ve always been known for special teams and Coach Beamer has his hands all over that, and I think they’ll be a great challenge for us."